In Ep. 240 of the Mullooly Asset Podcast, Tim and Brendan talk about a few articles that circle around probably the most important topic in personal finance: cash flows! With the government shutdown affecting hundreds of thousands of people, it’s a great time to emphasize the need for an emergency fund. 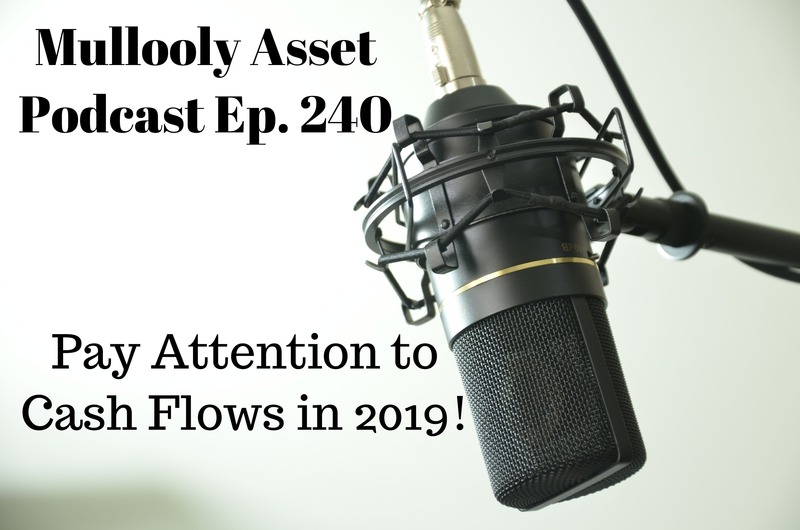 Tim Mullooly: Welcome back to the Mullooly Asset Management Podcast. This is episode number 240. This is Tim Mullooly filling in for Tom this week. Our other co-host as usual, Brendan, is here with us. Brendan: Getting ready to dive into an episode where I think we want to talk about cash flows, one of our favorite topics here. Tim Mullooly: Yeah, right. It feels like we talk about it a lot, but there are so many different problems and instances, and it is an issue for so many people that it’s something that you can’t talk about enough. Brendan: No, I completely agree. I don’t think you can beat the cash-flow horse to death at all. I don’t think that that’s possible. Brendan: As you alluded to there, people are going to have different issues with their cash flows crop up all the time, and one that we’ve been reading about recently with the government shutdown are a lot of the government employees and workers and what they’re doing with no paycheck coming in. I think they’ve passed the mark now where they would have received a check. This is 800,000 people or so who are not being paid. So, what are they doing now to deal with that? Tim Mullooly: Right. The shutdown is going on its third week, like you were saying. A lot of people get paid every couple weeks, so they’ve probably at least missed one … some people maybe two, depending on when they get paid … paychecks here. There was an article in CNBC that kind of broke down the amount of people that are missing paychecks, federal employees. Like you said, over 800,000 employees not getting paid right now. In the article they said the secret to success without a paycheck comes down to two tools. They said it was budgeting and borrowing. The borrowing aspect is not really something that I wanted to focus on that much, because in the article they suggested borrowing from friends and family, which I personally think is a little complex and sketchy. Brendan: Could get messy. I did like the thing that they said in there, though. It was like, “If you have to resort to this as a method to pay the bills, you should write it down,” so that it’s like, “I’m borrowing X from you, and I am going to repay it on this date,” or whatever the terms may be, just so it’s clear, because again, like you said, it can get very messy when you’re mixing finances with personal relationships. Tim Mullooly: Yeah. If you have no other option, I guess then that’s a better solution than looking to borrow money elsewhere. You might have to accept a higher interest rate or something. Tim Mullooly: You would think your friends and family wouldn’t charge you a huge interest rate. Brendan: Right. If they’re in a position to help you out, in many cases that might be a good way to go, because like you said, you’re not paying interest there. Brendan: I’ve heard of several credit unions … I don’t know about many of the big banks, but places are offering these short-term, low-interest type loans to people in this spot. But, just to jump back to that two tools topic, there’s the borrowing side and there’s the budgeting side. The budgeting side isn’t really going to help anybody now, unless they budgeted and they saved, and that means that they have a finite pile of money from an emergency fund. Maybe they can budget to make sure that only critical expenses and bills are coming out of that, and that means trimming back the lifestyle a little bit right now. Borrowing may be the only solution for some people. I have some numbers from a Market Watch article a couple of weeks back. It was a Nielsen survey. This just kind of speaks to the idea that government workers are not unique or incredibly irresponsible more than anybody else. Tim Mullooly: Yeah. We don’t want to seem like we’re putting the government workers on blast here. Tim Mullooly: This would happen to any industry that’s losing their paychecks. It just happens to be government workers right now. Brendan: Exactly. Pick a line of work and say, “Those people are now going without paychecks,” and we would be reading the same stories about them and how they’re going to try to make ends meet over this period of time. Just to speak to that, the Nielsen survey looked at percentage of people who say that they’re living paycheck to paycheck. 25% of people who make more than $150,000 a year say that they are living paycheck to paycheck. Brendan: That’s one in four. As the income goes down, as you would problem guess, that percentage gets a little higher. So, of people making between $50,000 and $100,000 a year, one in three, 33%, say they’re living paycheck to paycheck. Under $50,000 a year, half, 50%, say that they’re living paycheck to paycheck. This was a survey across all lines of work; so, just to say that there are a lot of people out there in this country who are relying on the next paycheck to come in and would be in trouble if it were not there. Tim Mullooly: So, like you were saying, these two tools that they mentioned, the budgeting aspect is definitely more precautionary, and the borrowing is more reactionary. If you’re in a tough spot, borrowing, like you said, might be the only place that you can go at this point. But, across the board, even if you’re making $150,000, if you’re bad at budgeting, you’re going to fall into that 25% of people who are living paycheck to paycheck. Brendan: Yeah. There’s a headline in the New York Times this week, too, just to pull that in, not to really dive into the article. It was making the case that even the super-wealthy need to do stuff like budgeting. I think that many of them might pooh-pooh that as something that poor people do, or whatever. But, looking at your cash flow, or budgeting, whatever you want to call it, is something that you should be doing no matter how much money you make. It’s just making sure that you’re doing the things that are important to you with your dollars and allocating them towards these purposes that make sense to you. No matter what your income level is, I think you can make some big changes to your life, regardless of the dollars and cents that it actually amounts to. Tim Mullooly: Yeah. If you’re in that category of people that are making, like, under $50,000 a year or you’re just getting started earning, you want to develop these good habits budgeting, because if you’re bad at budgeting when you’re making $50,000, you’re going to be bad at budgeting when you’re making $200,000 or $300,000. Brendan: Yeah, you have to grow out of it. Tim Mullooly: Right. The mistakes are just going to be larger. Brendan: They’ll probably compound, right? Tim Mullooly: Yeah. That’s what we talk about in the industry a lot. It’s called lifestyle creep. If you spend too much money when you make $50,000, you’re going to spend too much money when you’re making $5 million or whatever the number is. Brendan: No doubt. That’s a good point. Tim Mullooly: So, you just need to learn how to rein in … not rein in the spending, but just be more aware of where the dollars are going. I think that’s probably the biggest thing. So many people don’t even know where their money’s going on a monthly basis nowadays. Brendan: Kind of along the same lines, another article that we saw this week for the show was What You Should Know Before You Take a Loan Out Against Your Tax Refunds. This was on CNBC. Tim Mullooly: I’m going to be honest. I had just started hearing about people taking advances or loans on their tax refunds a couple weeks ago. I didn’t even know that this was a popular thing, because to me that idea just seems incorrect. You know what I mean? Like, if you need an advance on your tax refund, it goes back to cash-flow problem. Tim Mullooly: You need the money, right. Brendan: One, you need the money, and two, it’s a worthwhile amount. You’re not doing an advance for, like, 50 bucks. Tim Mullooly: For 20 bucks, yeah. I know this year some question marks in terms of how quick people will get tax refunds with everything going on. I think in many cases the guidance on the IRS website … Whether you want to believe that or not, in my experience it’s been pretty accurate … if you e-file, especially, they say, within 21 days, you’re going to get your refund. So, if you’re doing an advance or a loan, you’re really in a hurry to get that money. Tim Mullooly: Right. We’ve talked about it in videos and podcasts about how people view their tax refunds. I feel like people just look at it like this bonus, or like this gift, or they’re walking down the street and they see a couple hundred bucks laying there. Brendan: Yeah, that’s exactly it. It’s found money. Brendan: It’s yours. You’re entitled to that money. Brendan: They’re giving it back to you. Tim Mullooly: … they’re giving it back to you. Brendan: You should treat it like all of your other dollars. Tim Mullooly: Exactly, not like, “Oh, I’m going to go buy a big fur coat, because I got, like, a $500 refund” or whatever or just splurge on something that you don’t need. It is income for you that was in your paycheck. Brendan: No, and I think that you’re on the money with that. It’s mental accounting. We definitely do view money like this that comes in the tax refund or something similar, where it’s “found money” … We treat it differently, and I think that may be part of the reason that this industry for tax advances and loans actually exists. A lot of times, if you look at the costs and the fees associated with getting this money upfront or sooner, it’s very high, on a percentage basis, of the refund or the advance that you’re getting. I think that if you had to pay that interest or expense out-of-pocket rather than out of your pile of found money, you would pay closer attention. But people don’t care, because this is $500 they didn’t think they were going to have anyway. So, if a hundred of it goes out the door in interest and fees to get 400 today … “You can have $400 today, or you can have 500 in three weeks.” A lot of people, the instant gratifications wins, and they’d rather have the smaller amount now than the higher amount that they have to wait for a week, or two, or three. Tim Mullooly: It seriously is some crazy mental accounting, though, and it’s all in your head, though. Like you said, that’s $500 that people thought, “I wasn’t going to have.” That’s just a basic misunderstanding of how taxes work. I don’t know what needs to be done, I guess, to hit that point home for some people, that tax refunds, they are your money. Brendan: I don’t know. It’s easy for me to say, because I’ve never been in a position where I needed whatever the amount is within a certain amount of time. Like, I’ve never put myself in a spot to need that, or I’ve never been in a place like that; so, it’s tough to speak to that. I guess, when you need money, and there’s some kind of a deadline, and you can’t afford to wait potentially three weeks for the IRS to process and then distribute your tax refund, maybe it seems like a good option. I don’t know. There are definitely some changes in the way that we view these things that might help people to realize that the decision may not be such a great one to do stuff like this. Tim Mullooly: Yeah, definitely. I mean, along the lines of these are two articles that talk about some not ideal behavior in terms of personal finance, there was one article that you picked out. It was from Dan Egan at Betterment. He is a behavioral scientist. So, in terms of bad personal finance behavior, you won’t find much of it with Dan. He wrote an article about how he optimizes his monthly cash flow, which kind of is great to tie in with these two articles that we were talking about before. This is just how one person does it. Granted, Dan is a very smart guy. Brendan: I liked a lot of what Dan had to say. He certainly made sure to put that in the post a couple of times, that this is just his method of doing it, but it was kind of cool to see somebody who I respect and follow from Twitter, to see how he does this, to look under the hood, so to speak. One of the things that I really liked about it that I know that we drive home often with people was: Dan said to consider saving a bill and that spending is a negotiable part of the equation. That was one of his big principles, and then he got to it in the post. I also liked mechanically how this all flows for him. He kind of called it, like, an irrigation system of sorts. I love the way that he’ll describe stuff like this. It just makes sense to me. Brendan: Money’s flowing in, and then it’s being channeled off to these different areas to make sure all of these different things are being provided with the capital they need to continue. Tim Mullooly: Dan was talking about how he has one joint account with his wife, and their paychecks initially go in there. That’s the first stop. Brendan: Yeah, I liked that. They have this joint account. All the money that comes in during a month goes into there, and then everything kind of channels out from there. Tim Mullooly: Right. They pay the bills directly from that joint account, right? Brendan: Yeah, their big expenses, so Dan called them the boulders. They budget for their boulders, these big expenses like housing and some other areas. Tim Mullooly: Like school tuition, savings is a boulder. The last 20% he outlined in the article is for everything else. Brendan: Right. I don’t know exactly if this is how it works; but, for example, it sounded like it went something like this: If there’s 20% to other spending, after everything gets paid out of the joint account, these big bills that they budget for, maybe 10% apiece is going into his personal checking and his wife’s personal checking, and from there it’s up to them. They spend what they want to spend out of those accounts each and every month, and Dan said he doesn’t really track what he’s doing in those. He can’t spend what isn’t there, and so he knows that that money was sent there because they can spend it. He didn’t say it in this post, but it may save some couples from feeling guilty about spending money or from seeing your spouse come home, and you’re like, “What the heck did you buy that thing for?” Like, they walk in the door. If you work it this way, it doesn’t matter. If you or your spouse wants to splurge on some silly thing or whatever it may be, it’s okay. Tim Mullooly: Sure. Yet another Mets T-shirt. Tim Mullooly: I like the way that Dan phrased his checking account. He said, “I see holding cash in my checking account as a guaranteed small loss, so I minimize it.” He said the median checking account balance in the U.S. is, like, $2900. Brendan: There was a lot of discrepancy in that, right? Tim Mullooly: The distribution was pretty skewed, he said, but the average is just over $9,000. He said, for people his age with his income level and location, it’s even more. It’s about, like, $25,000. He said he usually has less than $1,000 in his checking account, and it gets down to about $300 or less by the end of the month. Brendan: I think that would make some people uncomfortable. Tim Mullooly: Right. Personally, that would make me a little uncomfortable. But, like we said in the beginning, this is just one guy’s way of doing it, and it works for him. So, having that little cash in your checking account may not work for everybody. Brendan: To his point also, to carry a balance of, like, $20,000 or even $10,000 in a checking account, when you aren’t going to spend that over the course of the month, most checking accounts, unless you have one with …. Some credit unions do this, or some banks have teasers, where they’ll pay interest on the first X thousand dollars in a checking account. But a checking account’s usually not getting any kind of interest at all. Brendan: So, to keep excess cash just floating around in there more than could even be conceivably spent in a month or two, it is a cost, and I think that’s what he’s alluding to. It’s a guaranteed small loss, in the sense that to some degree inflation eats away at whatever balance you have sitting there over the course of the year sloshing around. Tim Mullooly: He keeps that little amount in there and he sees it as a small loss, because it’s there to be spent. Like you were saying, if you have $25,000 or $20,000 in your checking account, you’re probably not going to spend that in a month, but you definitely can’t spend $3,000 in a month if you only keep a thousand dollars in your checking account. It’s not there. Tim Mullooly: It makes things like impulse buying, and online shopping, stuff like that, it makes it more enticing, because you know the money’s there. Tim Mullooly: … put money in a savings account or something and don’t put it in your easily accessible checking account. You’ve just got to know yourself, I guess. Brendan: To put a bow on this episode, I would say that across income levels, like we saw, and across all degrees of professionality … Like, Dan is a pro … people pay attention to cash flows to varying degrees. It’s an important topic that, no matter how much you make or what your profession is, I don’t think you should be glossing over it. There’s a lot that you can do underneath the surface. It’s not as boring as it may seem at the surface level. Dan had some pretty cool charts in this post that he made. Obviously, like always, we’ll link to that if you want to check it out. Yeah, cash flows, man. Tim Mullooly: You can do yourself a lot of good if you kind of get those under control, but you can also do yourself a lot of bad if you let it get out of control. Brendan: Yeah, agreed. Thanks to everybody for joining us on episode 240. We will be back next week with a new episode. Facebook IPO: Will This Be a Great Deal or a Bust? Market Drop: Could We Have Seen This Coming?